Effective communication is more of an art than a science. 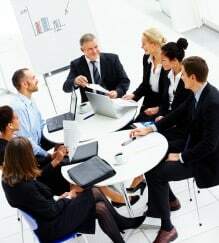 Leaders that master the art of effective communication connect with people on a personal and professional level. They break down barriers and strengthen relationships that can be beneficial far into the future. What I found extremely interesting was that a breakdown of communication contributed to each of the above listed factors. Infidelity often results when one partner does not adequately communicate their needs to their partner, but instead confides in someone else. Financial difficulty that leads to divorce usually occurs when one partner spends money without communicating it to the other partner. Depression and addictions are caused by many factors, but communication (which includes speaking AND listening) helps couples to work through their challenges. Stress can be alleviated through effective communication. Business relationship can break down just as easily with the lack of effective communication. So what are the benefits of effective communication? Effective communication creates connections, overcomes barriers, and builds strong teams. As a leader, effective communication creates connections with all those with which you come in contact. These connections are made as you take time to learn about others. Have you ever had a leader that asked you about your life, family, career goals, and other aspirations? That leader probably communicated with you in such a way that you felt valued. It probably helped you recognize your worth and value as a team player. Their communications with you probably gave you a special connection with them that will go on into the future. When you face a barrier, you can often overcome it through effective communication. For example, when someone is not living up to your expectations, take time to talk with them. Ask them why they are not living up to your expectations. There may be contributing factors of which you are unaware. You never know, there may be other people that are not doing their part that has led to their apparent failure. As you listen to them, focus on what they are saying and try to understand where they are coming from. Don’t just stay quiet as you formulate your next response. This communication will help you to overcome the barriers that exist. Once you listen to their side, help them know why you have specific expectations, how they are held accountable, and what will result if they fail to reach the expectations. As you have these talks, you will be able to come to a clear understanding with the other person by overcoming the barriers. Effective communication builds strong teams because it helps every team member to feel valued. As the leader, create an open flow of communication by listening to the thoughts, feelings, and ideas of the team. When you tell them you value them and then show them by listening and taking their suggestions seriously, it develops a strong sense of unity. As you team becomes stronger, you will be able to work together more effectively and have a strong sense of camaraderie. What Benefits Have You Seen From Effective Communication? What other benefits have you seen from effective communication with your team, spouse, coworkers, family, friends, etc.? How has that effective communication helped you to be more successful in your life? Please share your thoughts in the comments section below!